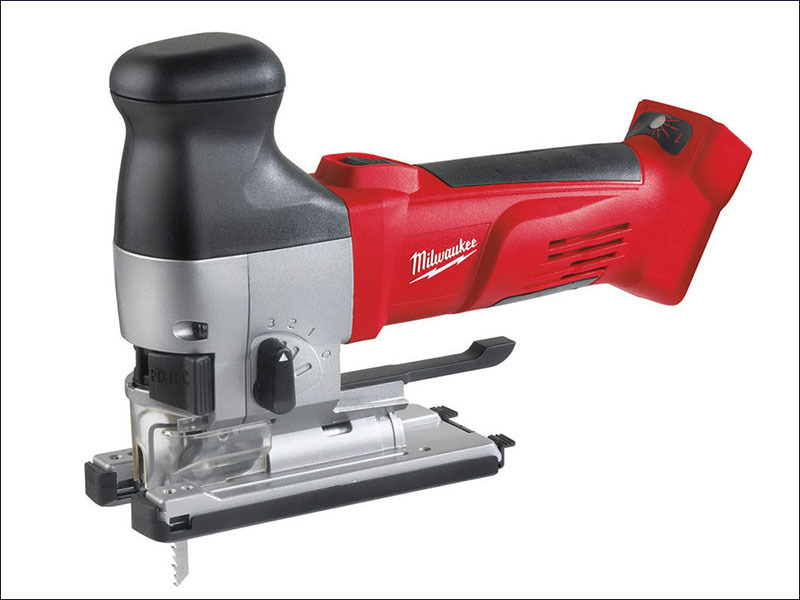 The Milwaukee HD18 JSB Body Grip Cordless Jigsaw allows four-stage adjustment of the pendulum action for increased cutting performance and longer saw blade life. A 2-speed selector switch allows an ideal speed to be selected for different materials. The base plate is die-cast for high durability. The jigsaw has a FIXTEC blade clamp for fast and easy keyless blade change and keyless base plate adjustments with snap-in feature at 0° and 45°. It has an exact saw blade guidance with large blade support roller on needle bearings, fitted in a very low position for a more accurate cut. The HD18 JSB has an adjustable sawdust blower and is soft starting. REDLINK™ overload protection electronics in the tool and battery pack deliver excellent durability. Strokes at no load: 2,050 / 2,700/min.